THERE'S no such thing as bad weather just travellers badly dressed for the weather, says the expedition leader as our rubber Zodiac boat skims over the low swell. It is mid summer in the ultra-remote Kuril Islands of far eastern Russia, which means near-zero temperatures and me wearing 18 items of clothing including gumboots and a bank-robber balaclava. 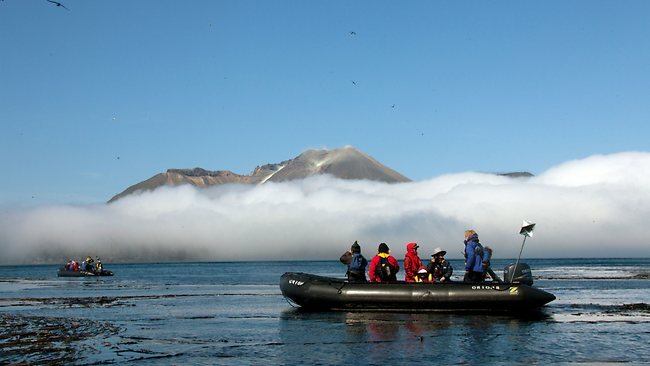 Our surroundings are volcanic peaks, kelp beds and shining fog banks. Sea otters casually float nearby on their backs. Another Zodiac radios us, swearing they see a supine otter clutching an empty vodka bottle to its chest. Too Russian to be true? I don't believe it until, back on our mothership, Orion II, I see the photo of this would-be blotto otter.